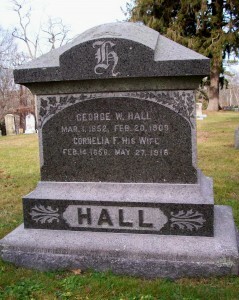 Born: March 1, 1852 in Rindge N.H.
Died: February 20, 1909 in Bourne Ma. Where Lived: Northboro Ma. & County Rd. in Cataumet Ma. 1. Edith Maude Hall Handy; (June 25, 1877 – 1957); Married Arthur Henry Handy (1875 – 1956) (Henry Thomas Handy & Lydia Perkins (Ellis)) in Cataumet Ma. on January 7, 1904; Edith & Arthur are buried in Cataumet Cemetery. 2. Frank Daniel Hall; (July 12, 1880 – 1956); Married Ida T. Scribner (1878 – 1953); Frank & Ida are buried in Cataumet Cemetery. 3. Gustavus Foster Hall; (December 1882 – July 17, 1959); Married Ruby Rebecca Higgins (1882 – 1974) (Webster Higgins & Amanda J. Parker) in Somerville Ma. on December 27, 1905; Gustavus & Ruby are buried in Cataumet Cemetery.